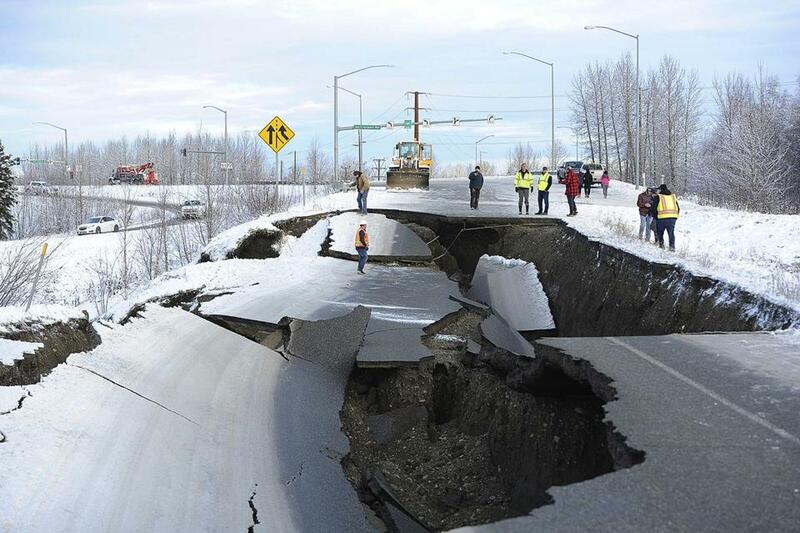 Workers inspected an off-ramp that collapsed during the November earthquake in Anchorage. ANCHORAGE — Seven weeks after a massive earthquake rocked Alaska, aftershocks are still shattering 7-year-old Connor Cartwright’s sense of safety. They shake the earth far less than the 7.0 magnitude quake that sent a mirror, TV, and dishes crashing to the ground in the Anchorage home where Connor lives with his mother, father, and 11-year-old brother. When the big aftershocks hit, ‘‘I feel like the house won’t hold up,’’ Connor said. Many of the aftershocks are so small that people don’t notice them, like a recent one that Connor didn’t feel at school — but his teacher had all the students dive under their desks to be safe. The latest big aftershock happened last Sunday — a magnitude 5.0 jolt that jangled already frayed nerves and prompted panicky posts on social media. That one ‘‘reminded people again that it’s not over yet,’’ said seismologist Natalia Rupert at the Alaska Earthquake Center. With no end to the seismic action in sight, Laura Dykes said her upcoming vacation to Las Vegas will be a huge relief from the stress she now experiences. The Anchorage law firm worker still has vivid memories of her basement office in a building swaying back and forth during the November earthquake. It was built on rollers to protect it from seismic events. The earthquake buckled roads, and some homes and buildings sustained heavy damage, with initial estimates to repair damage and other costs at about $100 million. No deaths or serious injuries were reported after last November’s quake, but federal officials soon declared a public health emergency and mental health aid was made available for people traumatized by the disaster. School counselors were swamped and crisis counselors were brought in from Oregon to help at several Anchorage-area schools. Therapists and other professionals struggled to meet demand from a nervous public. ‘‘It’s overwhelming for people, and they feel emotionally out of control,’’ said Deborah Gonzales, a licensed clinical social worker in Anchorage. Cartwright said her husband was at work when the main quake struck, and she and her sons ran out of the house and hugged each other as they huddled together outside. Along with broken family items, the only damage to their home was the widening of an existing hairline crack in a wall. But Connor couldn’t sleep in his own bed for weeks and only just returned to it. ‘‘You don’t know when the next one’s going to hit — that’s been unnerving,’’ he said. ‘‘I’d rather have the little aftershocks to keep from having the big one hit,’’ she said. Others shrug off the aftershocks as part of daily life in the most seismically active region of the country.